A responsible mariner in the Pacific Northwest needs to be well versed in the region’s weather or risk expensive property and lives of loved ones. What do you think of when you think about West Coast weather? Perhaps the beaches of sunny southern California or the fog and great sailing conditions of San Francisco Bay come to mind. How about the punishing winds of Cape Blanco, Cape Mendocino, or Point Conception? Maybe the great kite flying weather of Cannon Beach or Long Beach, or perhaps the winter storms? You know, the storms that can show up every other day and howl for weeks. But, to be fair, we here in the Pacific Northwest also enjoy some pretty darn nice stretches as well, and those perfect days are just one aspect of why we love living here. As a delivery captain with 150,000 miles over the last 20 years, I have experienced all of the above up close and personal many times over. The weather is the main concern of my business. When I move a boat, my timing is dictated by the weather and not by schedule, so I have to be very good at making sound, safe, and prudent decisions when it comes to the weather. I have had to become my own weather man. Over the years and miles of running boats up and down the West Coast, I have gained an intimate knowledge and respect for the weather patterns of the Eastern Pacific Ocean. When we think of the movement of air around the planet, we think of wind, i.e., the horizontal movement of air. However, most of the air in our atmosphere moves vertically, up and down. For the purpose of this article, we will only talk about the Northern Hemisphere, although the same dynamics happen in the Southern Hemisphere. It all starts at the equator. Air is heated and rises into the atmosphere. As it rises, it flows northward and cools. By the time it reaches approximately 30 degrees north, this colder, denser air starts to descend. Where this air descends, a high pressure area is created. In the Atlantic Ocean this area is called the Bermuda High, which is responsible for the Northeast Trade winds of the Caribbean. In our part of the world, it is called the East Pacific High. The East Pacific High is a dominant area of high pressure generally located between San Francisco and the Hawaiian Islands. The East Pacific High is responsible for the Northeast Trade winds of the East Pacific, and is why the West Coast of the United States and Baja California has prevailing winds from the north/northwest. The East Pacific High is the fundamental structure of our West Coast weather. Depending on the meandering course of the jet stream, it will drift north, south, east, or west. The low-pressure system storms that move across the Pacific will either move up and over the high, or in the case of larger, stronger systems, move it out of the way. The weather of the East Pacific fundamentally is a battle of wills between the forces of the East Pacific High and the lows of the jet stream. But through it all, the East Pacific High dominates the Northeast Pacific Ocean. If left to itself, the prevailing winds up and down the West Coast would be around ten knots from the north/northwest. But, as we mariners and beach dwellers who spend time out there know, that is not always the case. There is another little known feature of our West Coast weather. It is called the thermal low, and unless you study the weather like I do or listen to NOAA weather radio, you would never hear about it. Thermal low activity occurs year-round, but mostly spring through fall, over land where heating from the sun causes the air to rise. Rising air creates low air pressure. When this localized area of low air pressure is adjacent to the East Pacific High, the pressure gradient is greatest and much higher winds will occur. These areas of much higher winds can be several hundred miles long and extend up to a hundred miles offshore. They can produce sustained winds from 25 to 35 knots and, since the last few years, last from several days to several weeks. They generally set up in central Oregon and along California. The coastal areas that can experience these pockets of very high wind will vary with the position of the East Pacific High and the location of the thermal low activity. There are some typical locations that are notorious for these winds and they are also areas of high terrain. From Cape Blanco to the south, Cape Mendocino to the south, Point Arena to the south, and the Bay Area to the south to Point Conception. These capes and points can also exhibit the phenomenon known as Cape Effect. This is where the wind will be squeezed up against the high terrain of these areas and due to the Venturi effect be accelerated even faster. This brings us to the subject of waves. Waves we typically deal with are created by the wind, and their size is governed by how hard the wind blows and how far it blows. Waves will increase in size the farther they travel with a given wind speed until they reach a particular limit. For example, 15 knots of wind will produce a maximum wave height of about two feet. White caps begin to appear with a wind speed of around 12 knots. During the winter, when big storms come across the North Pacific, large ocean swells are one of the greatest spectacles and, for the surfers of the West Coast, one of nature’s greatest creations. From Huntington Beach to the North Shore of Oahu, and from Mavericks near Half Moon Bay to Westport, Washington, large ocean swell creates some of the best surf spots in the world. But for those of us trying to transit the West Coast, they can bring very hazardous conditions. Like I say often, “It’s all about the wave period.” I deliver boats north and south along the coast all year long. It is not uncommon for me to encounter large ocean swell during the fall through spring months. I have had many trips with a swell height up to 15 feet, but with a period of up to 15 seconds or more. I had one northbound trip with a swell of mostly 10 feet at 10 seconds. That is still relatively comfortable. My rule of thumb for a swell that is safe and manageable is a wave period that equals or is greater than the height of the wave starting at approximately 10 seconds. If the period is less than the height, you will want to avoid those conditions. The longer the period, the more gradual the wave. Most weather sites will give you forecast wave heights and dominant wave periods. The real problem we run into on the West Coast with large ocean swell is when we want to enter or depart one of our ports. Almost everyone has heard of the Columbia River Bar Entrance, the “Graveyard of the Pacific.” Well, every entrance from LaPush, Washington to San Francisco, California is a bar entrance. The only exceptions are Crescent City and Bodega Bay, both in California. One can come and go into those two ports under almost any condition. I will routinely enter and depart Crescent City with a large, long period ocean swell. With all of the other entrances, there are a few basic rules you need to follow. First, because of crab pot activity around most entrances and ports, I recommend coming and going only during the daylight. In fact, along most of the coast from Monterey Bay north, it is possible to find pots in water up to 400 feet deep. I only transit at night in water that is deeper than 400 feet. Second, crossing the entrances should be done only at slack or flood tidal current. When a wave approaches the entrance during an outgoing or ebb tide, that outgoing current will slow and build the incoming wave to create more hazardous conditions. Unless it is relatively fl at outside, cross only during the slack or fl ood and always only in the daylight. Understanding the basic components and function of our West Coast weather is the first step. Learning how to watch it and use it effectively and safely is the second. There are three basic tools that I use in my travels up and down the coast. The first is a website that gives me winds, wave heights, and wave periods every three hours out to seven days: buoyweather.com. It uses computer generated forecast models from the North American Model, the computer model that all weather forecasters use in the United States. Second is The National Weather Service (NWS). The NWS provides marine forecasts out to five days. Personally, I use NWS Eureka, California’s website, because it has a page with all of the forecast areas in one place. The website is basically one-stop shopping for the entire West Coast. I will use NWS forecasts in conjunction with the buoyweather models. Third, and probably one of the most useful, is a website that gives me access to all of the weather buoys from Puget Sound to Southern California. National Data Buoy Center gives me real time hourly observations from weather buoys and stations located on the coast. It is an invaluable tool to actually see what is happening and to compare real time with what has been forecasted. We are unique here on the West Coast of North America. Our weather travels from west to east over thousands of miles of open ocean, from the rains of the Pineapple Express to the almost hurricane force winds of our winter storms, and from gigantic long ocean swell to the amazing clear blue skies of a winter high. We live in a pretty special place with some very special weather. Whether you boat in Puget Sound, the Columbia River, the Bay Area, or Southern California, our West Coast weather can be a treat or a test. 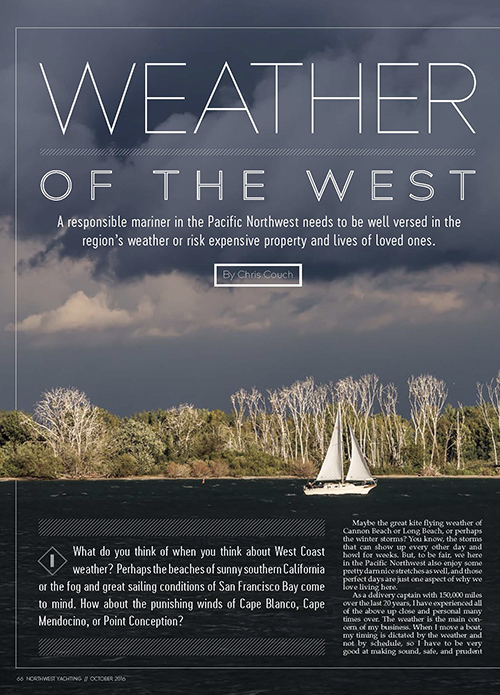 It is important that if we are to be safe and get the most from our West Coast weather experience, we must do and practice these three things: Keep your vessel and equipment properly maintained, always plan ahead and think ahead, and above all, make safe, prudent decisions with regards to the weather. As I write this, the last several years has seen some interesting shifts in our West Coast weather, shifts that not only have directly affected my business in yacht delivery, but impacts every mariner who transits the West Coast and even everyone who lives in the western United States. However you feel or whatever you think about climate change, things are changing. The Arctic is warming, and with the decreasing temperature difference between the Arctic and the mid-latitudes has come a shift in the behavior of the jet stream. There are literally hundreds of scientists and studies when it comes to this, but it is probably best explained and backed up in an article by Dr. Jennifer Francis in the Scientific American “Weird Winter Weather Plot Thickens as Arctic Swiftly Warms” (Feb. 19, 2015). This is the same jet stream that effects the direction of the North Pacifi c lows and the position of the East Pacific High. With the shift we are seeing, the East Pacific High is positioned in ways that block rain-bearing storms from getting through to the West Coast, which has led to dryer and warmer conditions for all of us. For me, and for anyone wishing to transit the coast, the East Pacific High has been setting up and staying relatively stationary for much longer periods of time. Along with warmer temperatures, thermal low activity also sets up for longer periods of time. This in turn has created the pockets of higher winds which now can last up to several weeks. For anyone wishing to experience the West Coast environment safely, proper planning and decision making are the keys. But having a lot of patience and flexibility have also become very necessary, especially as things are a’ changing. Captain Chris Couch is a successful Pacific Northwest-based delivery captain who has been widely used by companies like Ocean Alexander and Nordhavn for the last 26 years. Couch enjoyed a 14-year career in the U.S. Coast Guard that took him around the country to the East Coast, Gulf, and West Coast on all kinds of vessels. He has been at the helm through the Panama Canal five times and for four transpacific crossings. His The Checklist is enjoyed by and distributed to yachts owners and is a fantastic resource that covers just about everything Pacific Northwest. You can buy the The Checklist, check out his other publications, or contact him at compassheadings.com.